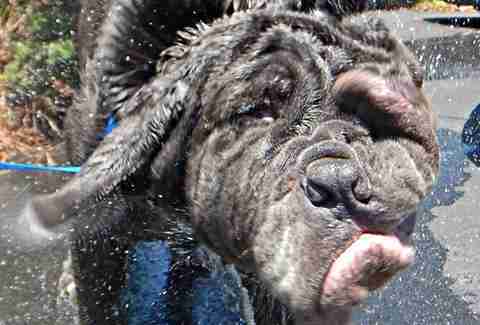 Martha, a lumbering 125-pound Neapolitan mastiff, made headlines this week as the winner of the annual “World’s Ugliest Dog” competition, taking home the $1,500 cash prize and landing a spot on NBC’s "Today Show." 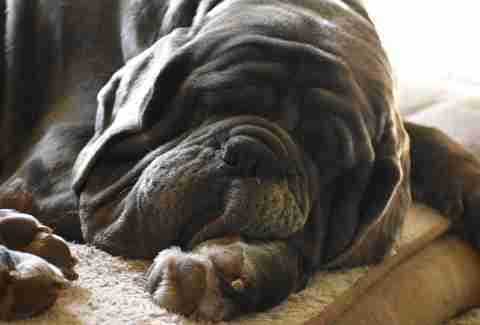 Her droopy jaws and devil-may-care attitude garnered her instant adoration from the judges and crowd, but what a lot of her fans don’t know is that Martha is a rescue dog living the consummate rags-to-riches story. 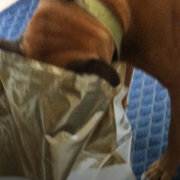 The 3-year-old coffee-colored mastiff began her life as a dog nobody wanted. Sold on Craigslist by her previous owners, Martha found a temporary home at the Dogwood Animal Rescue Project in Santa Rosa, California. 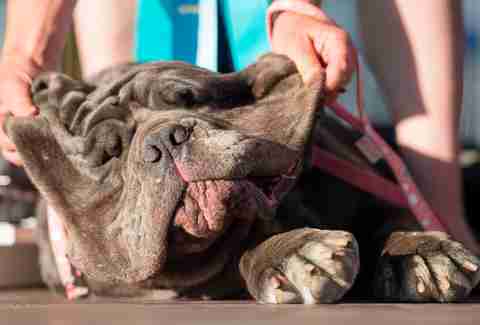 Her heavily wrinkled face, impressive size and sweet demeanor instantly endeared her to the rescue workers, but Martha’s health was in decline. Her early life hadn’t been easy. She had given birth to at least one litter of puppies, lived outdoors for extended periods and, what’s more, she was blind. 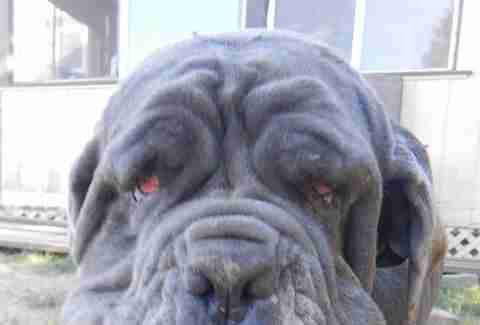 Suffering from two painful eye conditions, cherry eye and a genetic condition known as entropion (where the eyelid folds inward, and the eyelashes cause irritation as they rub against the cornea), Martha needed immediate surgery to help correct what her previous owner’s neglect had wrought. 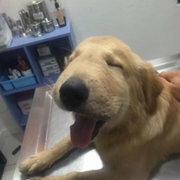 “After two surgeries, she is pain-free and gets around great with limited vision,” Charlotte Tunstall Pearce, head of development at Dogwood Animal Rescue Project, tells The Dodo. 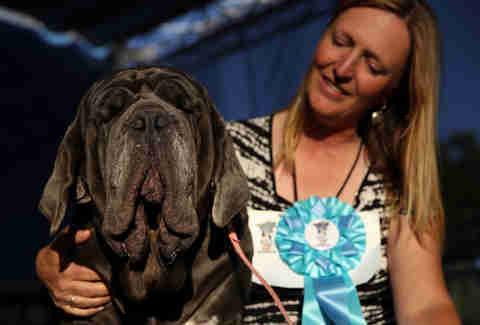 Martha’s unique appearance prompted her caretakers at Dogwood to enter her in the World’s Ugliest Dog competition at the Sonoma-Marin Fair on June 24. Shirley Zindler, president and cofounder of Dogwood Animal Rescue (and foster mom to Martha), acted as her handler. “Dogwood Animal Rescue was invited to attend the competition’s pre-show dog fashion show and we thought Martha might be the perfect contestant, as she isn’t traditionally beautiful with her drool, wrinkles, red eyes and saggy face,” Pearce says. There, Martha faced off against 13 formidable competitors, most of whom were older and far smaller than the young mastiff. True to form, when her big win was announced, Zindler accepted the ribbon as Martha snoozed at the edge of the stage. As news of Martha’s win spread, many on social media took umbrage with the title, bristling at the thought of the large breed being called “ugly.” A flurry of tweets came to Martha’s defense, describing her as “cute,” “stunning” and “beautiful” — and we couldn’t agree more. “She represents many dogs in shelters with imperfections, but [who] are amazing animals,” Pearce says. When the adoption is finalized this week, Martha will join a loving family with two other dogs and 11 acres of land. While space will be plentiful at her new home, knowing Martha, the champ will probably be more interested in taking languorous afternoon naps. Meanwhile, the $1,500 prize money will go toward the Dogwood Animal Rescue Project, saving another dog or cat in need.